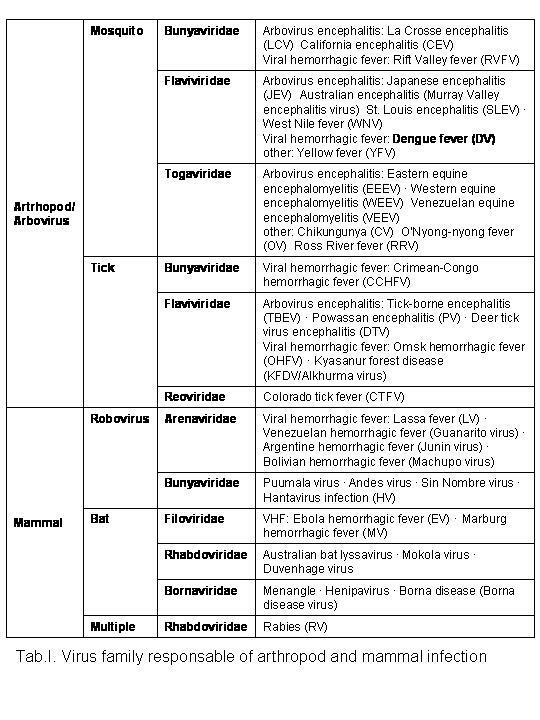 Dengue belongs to single strand RNA virus, Flaviviridae family, genus Flavivirus ( Fig1, TabI ). It has four different serotypes called DEN1, DEN2, DEN3 and DEN4. It cause the most common dengue fever (DF) and dengue hemorrhagic fever (DHF), acute febrile diseases, found in the tropics. It is also known as breakbone fever. The geographical spread includes northern Australia and northern south merica and southeast Asia. DF and DHF are primarily diseases of tropical and sub tropical areas, and the four different dengue serotypes are maintained in a cycle that involves humans and the Aedes mosquito. However, Aedes aegypti, a domestic, day-biting mosquito that prefers to feed on humans, is the most common Aedes species. Infections produce a spectrum of clinical illness ranging from a nonspecific viral syndrome to severe and fatal hemorrhagic disease. Important risk factors for DHF include the strain of the infecting virus, as well as the age, and especially the prior dengue infection history of the patient. The disease manifests as a sudden onset of severe headache, muscle and joint pains (myalgias and arthralgias-severe pain that gives it the nick-name break-bone fever or bonecrusher disease), fever, and rash. The dengue rash is characteristically bright red petechiae and usually appears first on the lower limbs and the chest; in some patients, it spreads to cover most of the body. There may also be gastritis with some combination of associated abdominal pain, nausea, vomiting, or diarrhea. Some cases develop much milder symptoms which can be misdiagnosed as influenza or other viral infection when no rash is present. Thus travelers from tropical areas may pass on dengue in their home countries inadvertently, having not been properly diagnosed at the height of their illness. Patients with dengue can pass on the infection only through mosquitoes or blood products and only while they are still febrile. The classic dengue fever lasts about six to seven days, with a smaller peak of fever at the trailing end of the disease (the so-called biphasic pattern). Clinically, the platelet count will drop until the patient's temperature is normal. Cases of DHF also show higher fever, variable haemorrhagic phenomena, thrombocytopenia, and haemoconcentration. A small proportion of cases lead to dengue shock syndrome (DSS) which has a high mortality rate. DHF combined with a cirrhotic liver has been suspected in rapid development of hepatocellular carcinoma (HCC). Given that the Dengue virus (DEN) is related to the Hepatitis C virus, this is an avenue for further research as HCC is among the top five cancerous causes of death outside Europe and North America. Normally HCC does not occur in a cirrhotic liver for ten or more years after the cessation of the poisoning agent. DHF patients can develop HCC within one year of cessation of abuse. The diagnosis of dengue is usually made clinically. The classic picture is high fever with no localising source of infection, a petechial rash with thrombocytopenia and relative leukopenia - low platelet and white blood cell count. 1. Fever, bladder problem, constant headaches, severe dizziness and loss of appetite. •	Cold, clammy skin and restlessness. Serology and polymerase chain reaction (PCR) studies are available to confirm the diagnosis of dengue if clinically indicated. The establishment of infection requires the entry of dengue virus into cells (mainly macrophages and endotelial cells, but also pulmonary, linfatic cells and T-helper linfocytes) followed by release of nucleocapsid. The E protein also provides the first point of contact between the virus and the host cell. Several cellular proteins and carbohydrate molecules that function as attachment factors mediating viral entry have been identified, and these molecules have been shown to interact with the E protein [15, 16 B. Tassaneetrithep, T.H. Burgess, A. Granelli-Piperno, C. Trumpfheller, J. Finke, W. Sun, M.A. Eller, K. Pattanapanyasat, S. Sarasombath and D.L. 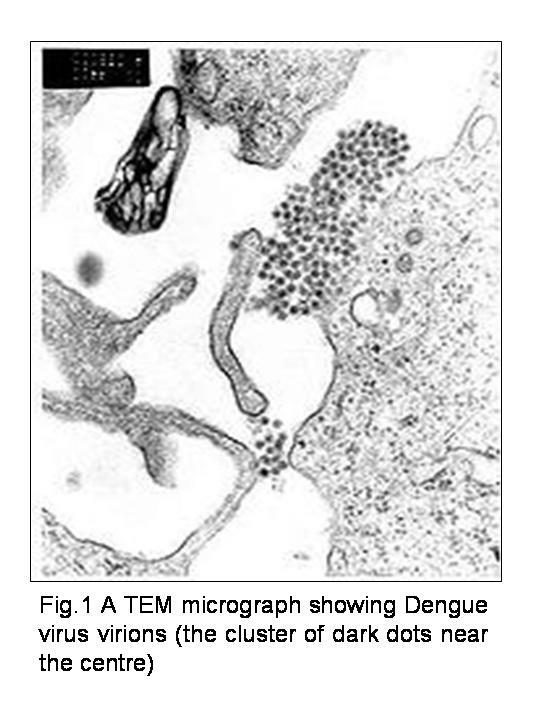 Birx et al., DC-SIGN (CD209) mediates dengue virus infection of human dendritic cells, J Exp Med 197 (2003), pp. 823–829. Full Text via CrossRef | View Record in Scopus | Cited By in Scopus (199)16, , , ,  and ]. These attachment factors assist in concentrating the virus on the cell surface increasing its access to specific cellular receptor/s. Structural insight into the interaction of E with one of these attachment factors, dendritic-cell-specific ICAM3-grabbing non-integrin (DC-SIGN)  has been obtained. Unfortunately, a specific cellular receptor for dengue has not yet been identified. It is possible that currently identified attachment molecules could function as specific cellular receptors for dengue. However, it would be necessary to demonstrate that they mediate clathrin-mediated endocyotsis of the particle and this has not been shown for any of these putative receptors to date. Infection is mediated by the E-cadherin on the surface of cells and DEN-2 surface receptor on virus capside. Infection occurs in different kind of cells, as explain by Seema and S.K.Jain 2005, but it is crucial when infects endothelial cells, causing thrombocytopenia and vascular permeability. The death rate associated with the more severe form DHF is approximately 5%, predominantly in children under the age of 15. Although intensive efforts have been made to study the early clinical pathophysiology of dengue infection with the objective to identify the potential cause of DHF, results or data that have accumulated from different regions of the world involving studies of different ethnicity groups are inconsistent at present in terms of identifying a unified hypothesis for the pathogenesis of DHF. Noisakran et al. 2008 review about identification of alternate factors, such as innate immune parameters (see figure below or link), hyper-thermal factors, conditioning of neutralizing antibody, concept of vector transmission, and physical status of virus in viremic patients that may play a role in the induction of DHF. Figure (from Noisakran et al. 2008): Innate immune encounter upon virus injection in the capillary vessel. There are several immune-related components circulated in the capillary, which is surrounded by multiple cell layers. The enlarged circle indicates the mosquito’s probing site. Prior to the feeding process, mosquito saliva-containing factors (e.g., apyrases) and virus are released into the blood stream. The first reported epidemics of DF occurred in 1779-1780 in Asia, Africa, and North America. The near simultaneous occurrence of outbreaks on three continents indicates that these viruses and their mosquito vector have had a worldwide distribution in the tropics for more than 200 years. During most of this time, DF was considered a mild, nonfatal disease of visitors to the tropics. Generally, there were long intervals (10-40 years) between major epidemics, mainly because the introduction of a new serotype in a susceptible population occurred only if viruses and their mosquito vector could survive the slow transport between population centres by sailing vessels. A pandemic of dengue began in Southeast Asia after World War II and has spread around the globe since then. Epidemics caused by multiple serotypes are more frequent, the geographic distribution of dengue viruses and their mosquito vectors has expanded, and DHF has emerged in the Pacific region and the Americas. In Southeast Asia, epidemic DHF first appeared in the 1950s, but by 1975 it had become a frequent cause of hospitalization and death among children in many countries in that region. There is significant evidence, originally suggested by S.B. Halstead in the 1970s, that dengue hemorrhagic fever is more likely to occur in patients who have secondary infections by another one of dengue fever's four serotypes. One model to explain this process is known as antibody-dependent enhancement (ADE), which allows for increased uptake and virion replication during a secondary infection with a different strain. Through an immunological phenomenon, known as original antigenic sin, the immune system is not able to adequately respond to the stronger infection, and the secondary infection becomes far more serious. This process is also known as superinfection and is particularly frequent in AB blood group ( see1 ). Reported cases of dengue are an under-representation of all cases when accounting for subclinical cases and cases where the patient did not present for medical treatment. With proper medical treatment the mortality rate for dengue can be brought down to less than 1:1000. In 2007 CDC launched guideline through a sensibilzation brochure ( see2 ) about mosquito’s biting. Just in 2009, epidemic broke out in Bolivia, in which 18 people have died and 31,000 infected and in Argentina, in which dengue was declared the northern provinces of Chaco, Catamarca, Salta, Jujuy, and Corrientes, with over 9673 cases reported as of April 11, 2009 by the Health Ministry. Some travelers from the affected zones have spread the fever as far south as Buenos Aires. Major efforts to control the epidemic in Argentina are focused on preventing its vector (the Aedes mosquitoes) from reproducing. This is addressed by asking people to dry out all possible water reservoirs from where mosquitoes could proliferate (which is, in other countries, known as "descacharrado"). There have also been information campaigns concerning prevention of the dengue fever; and the government is fumigating with insecticide in order to control the mosquito population. The last world distribution of dengue map ( see3 ) comes from CDC (Centers for Disease Control and prevention) in 2008. Unlike malaria, dengue is just as prevalent in the urban districts of its range as in rural areas. Each serotype is sufficiently different that there is no cross-protection and epidemics caused by multiple serotypes (hyperendemicity) can occur. The World Health Organization (WHO) says some 2.5 billion people, 2/5 of the world's population, are now at risk from dengue and estimates that there may be 50 million cases of dengue infection worldwide every year. The disease is now epidemic in more than 100 countries. The mainstay of treatment is timely supportive therapy to tackle shock due to haemoconcentration and bleeding. Close monitoring of vital signs in critical period (between day 2 to day 7 of fever) is vital. Increased oral fluid intake is recommended to prevent dehydration. Supplementation with intravenous fluids may be necessary to prevent dehydration and significant concentration of the blood if the patient is unable to maintain oral intake. A platelet transfusion is indicated in rare cases if the platelet level drops significantly (below 20,000) or if there is significant bleeding. The presence of melena may indicate internal gastrointestinal bleeding requiring platelet and/or red blood cell transfusion. Aspirin and non-steroidal anti-inflammatory drugs should be avoided as these drugs may worsen the bleeding tendency associated with some of these infections. Patients may receive paracetamol preparations to deal with these symptoms if dengue is suspected. Emerging evidence suggests that mycophenolic acid and ribavirin inhibit dengue replication. Initial experiments showed a fivefold increase in defective viral RNA production by cells treated with each drug. In vivo studies, however, have not yet been done. Unlike HIV therapy, lack of adequate global interest and funding greatly hampers the development of treatment regime. In Brazilian Traditional medicine, dengue is treated with cat's claw herb, which is for inflammation and does not prevent dengue. In Malaysia, dengue is newly treated using Mas Ayu Amirtha and Semalu developed by the Alternative Medicine Research Institute, Center for Asia. The treatment is said to arrest and reverse the viral infection and prevents the disease from advancing into a critical stage by following their dosage requirement. There is no commercially available vaccine for the dengue flavivirus. However, one of the many ongoing vaccine development programs is the Pediatric Dengue Vaccine Initiative which was set up in 2003 with the aim of accelerating the development and introduction of dengue vaccine(s) that are affordable and accessible to poor children in endemic countries. ( see4 ) Thai researchers are testing a dengue fever vaccine on 3,000–5,000 human volunteers after having successfully conducted tests on animals and a small group of human volunteers. A number of other vaccine candidates are entering phase I or II testing. Dengue virus belongs to the family Flaviviridae, which includes the hepatitis C virus, West Nile and Yellow fever viruses among others. Possible laboratory-based modification of the yellow fever vaccine YF-17D to target the dengue virus via chimeric replacement has been discussed extensively in scientific literature. To date, however, no full scale studies have been conducted. Around 2006, a group of Argentine scientists discovered the molecular replication mechanism of the virus, which could be specifically attacked by disrupting the viral RNA polymerase ( see5 , see6 ). In cell culture and murine experiments, morpholino antisense oligos have shown specific activity against Dengue virus. In 2007 Aleshin et al. ( see7 ) attenuated virus replication by interfering with activity of the dengue viral protease; subsequently, a project to identify novel protease disruption mechanisms has been launched.